Undoubtedly, Europe is one of the regions most thoroughly picked-over by descriptive taxonomists, particularly in the case of an insect group as comparatively popular with entomologists as the beetles (Coleoptera). Nonetheless, unexpected oddities in the beetle department do crop up in the western Palearctic from time to time. The incomparable Crowsoniella relicta (placed in a monotypic family) is known from soil samples collected from the base of a single Italian chestnut tree (Pace, 1975), while Urtea graeca (a genus and species known from a single locality in northern Greece) is the only European representative of the oddball Atractocerinae (Lymexylidae), a wood-boring taxon that aside from a single Japanese species (Arractocetus nipponicus) is restricted to the tropics and southern hemisphere (Paulus, 2004). 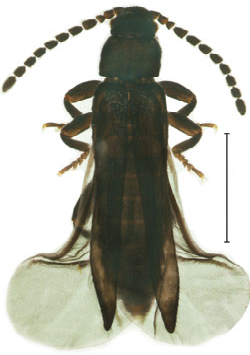 Male Iberobaenia minuta; scale bar=1 mm. Last December, an entirely new beetle family was described from the mountains of southern Spain, including the single genus Iberobaenia and two species distinguished upon the basis of the male genitalia (Bocak et al., 2016). What appears to be a third, still-undescribed species is known only from a third-instar larva. The circumstances of their discovery warrant some explanation: the larvae were collected for soil biodiversity surveys in southern Spain and noticed when metagenomic analysis of these samples revealed mitochondrial sequences within the Elateroidea (click beetles and kin) that did not nest within any family; these sequences allowed linkage of these larvae with adult male specimens, which had been collected by sweeping foliage. Interestingly, the relative positioning of protein-coding and ribosomal genes in the beetle's mitogenome had been altered from the putatively ancestral condition, this being the first such rearrangement documented in the Coleoptera (Andujar et al., 2016) and an abnormal occurrence for any insect, which tend to be conservative with respect to mitochondrial gene order (Cameron, 2014). In appearance, Iberobaenia is clearly elateroid in both known ontogenetic stages. The tiny, soft-bodied male imagos resemble, in their reduced mouthparts and lack of elytral costae or tubercles, other elateroid lineages that have undergone miniaturization relative to the superfamily's norm. Their habitus is most comparable to such genera as Paradrilus (Omalisidae) and Antennolycus (Lycidae), but iberobaeniids differ from these in their hypognathous* mouthparts (in contrast to omalisids), lack of a pronotal margin (differing from lycids and non-paradriline omalisids in this respect), and uncompressed legs (here being distinct from otherwise comparable lycids). Larvae are not dorsoventrally flattened and lack urogomphi† (unlike their lycid counterparts), with robust convergent mandibles (Bocak et al., 2016). A taxonomically comprehensive molecular phylogenetic analysis of the Elateroidea, using two loci each from the nuclear and mitochondrial genomes, retrieved Iberobaenia as the sister group of the Lycidae (net-winged beetles). Male miniaturization in the genus is noteworthy in terms of speculation on iberobaeniid biology. Elateroids with males of this dwarfish, soft-bodied description tend to be sexually dimorphic, and if comparison of Iberobaenia to these better-known cousins is valid, its unknown females are probably larviform crustacean-like things far larger than their paramours. This syndrome has evolved on multiple occasions throughout the Elateroidea, with examples of flightless lycid females looking more like denizens of the Sea of Corruption than inhabitants of the East Indies (see above). While Iberobaenia is certainly distinctive in that it cannot be confidently placed in any elateroid family, I personally doubt that its assignment to an entirely new one will hold under future acquisition of more genetic data. From a morphological standpoint, the proposed Iberobaeniidae lacks any nomothetic‡ characters, meaning that we must rely upon the phylogenetic analysis of Bocak et al. (2016) for justification of its ranking as family. This phylogeny (with Elaterophanes and Aphodiites, which are respectively the oldest known elateriforms and scarabaeiforms, as calibration priors) suggests that Iberobaenia branched from its most recent common ancestor in the mid-Jurassic: I wonder how much water mitogenomes (from which half of the data used in this analysis were drawn) hold at that timescale, given their famously rapid rate of mutation (Brown et al., 1979). As with so many things in our world, more data would be welcome. †Superficially cercus-like processes on the terminal segments of some beetle larvae. ‡One particular feature that is unique to the taxon in question. Brown, W. M.; George, M. Jr.; and Wilson, A. C. (1979). Rapid evolution of animal mitochondrial DNA. Proc. Nat. Acad. Sci. USA, 79, 1967-1971. Cameron, S. L. (2014). Insect mitochondrial genetics: implications for evolution and phylogeny. Annual Review of Entomology, 59, 95-117.